This drawing shows a view of Lima, Peru featuring two major domes; the one on the left appears to be a church because of the cross at the top. Title from drawing. Daniel W. Coit made many sketches during his travels in S. America, Mexico, California, and Europe, all prior to his visit to Grand Rapids in 1833. Coit was in Lima, Peru from 1819-1820, and again from 1823-1828. 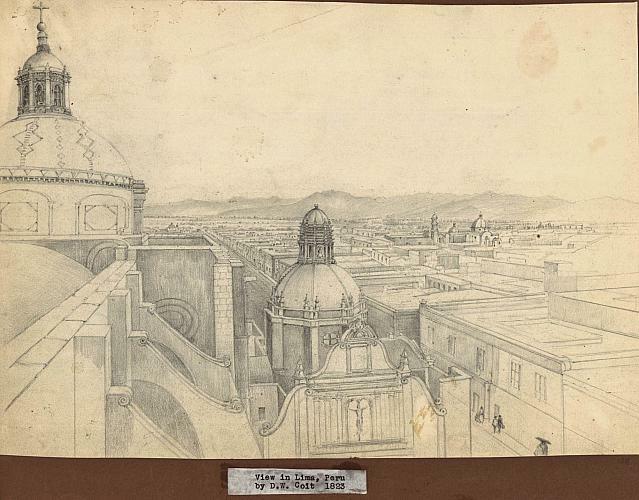 Many of the drawings in our online collection are dated from the second time period. The drawings are the property of Coit family members and may not be reproduced in any form, print or digital, without permission.